In 2015, Justin Trudeau assembled the first federal cabinet to achieve gender parity. When asked why this was so important to him, he replied with the now-famous phrase, “because it’s 2015.” This argument was heard as a call to action for many across Canada, who redoubled efforts to champion equal representation for women in senior roles. Four years later, many companies in traditionally male-dominated sectors like engineering and law are taking decisive action to promote diversity at all levels of their organizations. 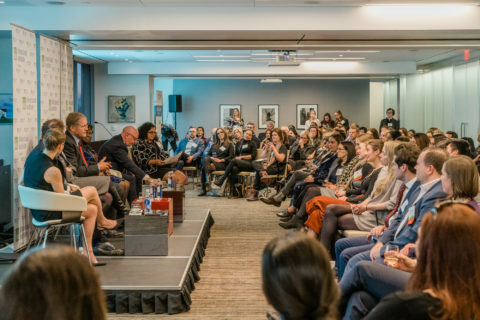 To explore the lessons learned from these initiatives, WLI Toronto invited industry leaders to contribute to a panel discussion moderated by Toni De Mello, Director of Human Rights Services at Ryerson University. De Mello is responsible for leading the development and implementation of discrimination and harassment prevention policies, and uses her background in law to advise senior management on human rights issues and obligations at Ryerson. 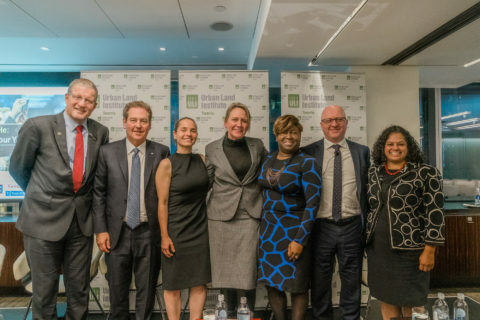 The event was hosted by Goodmans LLP, a Toronto-based full service law firm that frequently supports ULI Toronto programming. The event was so well-attended that additional seating had to be brought into the room, with all genders well represented. Ann Joyner, a Women’s Leadership Initiative Co-Chair responsible for organizing the event, kicked things off with a reminder of Trudeau’s iconic words and a call to embody them by celebrating the women who inspire us. De Mello began the discussion with a sobering statistic. “Due to the wage disparity between men and women, a woman needs to work an average of 13 years longer before they can retire,” she said. We are now seeing women from many different backgrounds rise in many different ways, but we still have a long way to go. Kiabi D. Carson, Head of Human Resources, North America at Turner & Townsend, was the first to weigh in on the requirements for real, lasting change. “Diversity needs to be a formal commitment with standards for salaries, promotions, and development programs,” she said. Carson brings over 20 years of experience spanning the financial and real estate sectors in both the US and Canada, and said she has never seen diversity happen organically. Carson’s colleague Gerard McCabe agreed. As Managing Director, Canada and a founding member of cm2r who has practiced engineering since 1987, McCabe says he has experienced the challenge of attracting and retaining women in the engineering field firsthand. “Working conditions are an important consideration,” said McCabe. Creating spaces where women feel included as equals requires a thoughtful discussion of the existing office culture. De Mello’s next question was directed at Dale H. Lastman, Chair of Goodmans LLP and a Director of RioCan Real Estate Investment Trust, Maple Leaf Sports and Entertainment, and the CAMH Foundation. When asked what leaders can do to embrace and empower women, Lastman said, “we need to create an environment where people are passionate and comfortable speaking about their passions. To do that, we need to be vulnerable.” This call for authenticity was echoed by other panelists throughout the conversation. Phil Verster, CEO of Metrolinx, brought his global perspective from working in the electricity and rail sectors in South Africa and the UK. “I want diversity not just because it will feel better, but because it will make my team better,” said Verster. “Diverse teams make quicker decisions and are better equipped to change course.” De Mello agreed that diverse teams look at problems differently, allowing them to create and innovate differently. 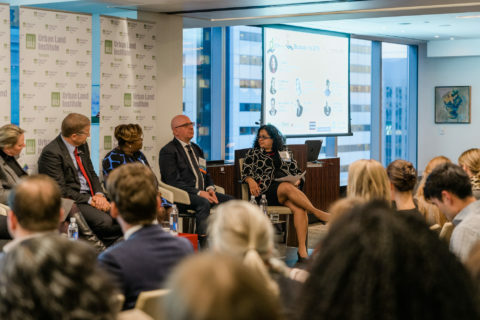 “By shifting to a performance culture, we can see the value of diverse approaches and perspectives in hard numbers,” said Lorraine Huinink, Vice President of Corporate Real Estate at Metrolinx. Huinink is responsible for a property portfolio of just under 4,000 acres and has worked on numerous development initiatives including UNESCO world heritage sites and the Pan Am Athlete’s Village in Toronto. Anne Benedetti, Partner and member of the Executive Committee at Goodmans LLP, stressed the importance for leaders to give back by teaching, leading and mentoring. She celebrated her own mentor, Lastman, who took an interest in her unique skill set and devised ways for her to develop and demonstrate it. “Mentorship is not just coffee, it’s about making people feel empowered in what they are doing and providing opportunities for them,” said Benedetti. Following the discussion, attendees reflected on the importance of connecting issues of equality with a company’s performance metrics and bottom line. With such a sound business case to be made for diversity, industry leaders in 2019 must understand that it is possible to do well by doing good.